The overall steam turbines market in India for under 30 MW size remained at the same level as the previous year and in line with that our domestic order booking has remained flat during the year at ₹ 4.1 billion. The market condition has led to considerable competition, which in turn resulted in lower prices and declining margins. 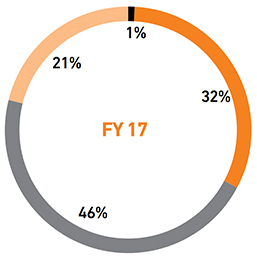 The Company continues to retain the market leadership with a market share of 64%. 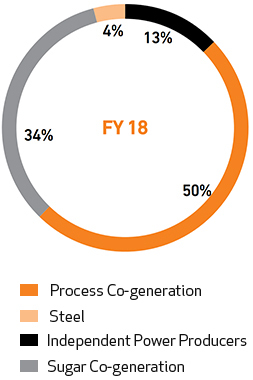 The enquiries from the domestic market increased during the current year by 7% over last year and these enquiries have been spread over larger end user segments such as Sugar, Cement, Steel, Paper and Pulp and other process industries. In FY 18, the total order booking from International market stood at ₹ 4.19 billion, a growth by 40% over previous year. 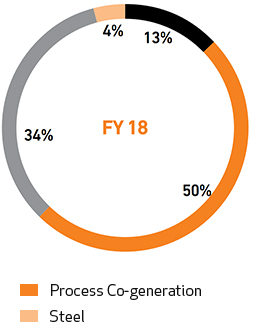 The renewable based IPP segment contributed 65% of the total exports order booking while the process co-generation and sugar co-generation segments contributed 25% and 10% respectively. With the International Market stabilising after a tumultuous FY 17, resulting from Brexit, political and economic turmoil in various economies across the globe, orders finalisations have significantly improved in the current year from most of the international markets. In FY 18, the total order booking from International market stood at ₹ 4.19 billion, a growth of 40% over previous year. 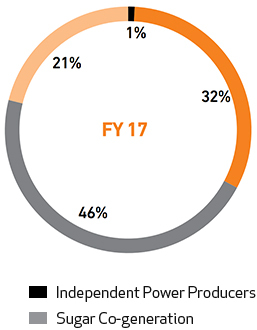 The renewable based IPP segment contributed 65% of the total exports order booking while the process co-generation and sugar co-generation segments contributed 25% and 10% respectively. The key geographies which have recorded the orders are Europe including Turkey, SEA Markets, SAARC and parts of Africa, Central & South American countries etc. The mix of exports in total order booking has increased to 51% in FY 18 from 42% in FY 17. The Aftermarket team is responsible for nurturing relationship with the customers after the product is supplied and represents the Company to the customers to support the product throughout its life cycle. The team maintains close relations with customers to increase product efficiencies and minimise breakdown, not only for the products supplied by the Company but also for turbines of other makes. Being an OEM, the services provided by the Company are considered to be more reliable and credible. It is responsible for driving customer satisfaction by ensuring designed performance of turbines through service and spares support to the customers in a timely manner. Aftermarket business has now been further fortified with focus on modernisation, upgrades, refurbishing and efficiency improvements solutions not only to its own turbines, but also to turbines of other makes. These enhancement packages guarantee adequate ROI for the end user, thus creating more value for them and strengthening their bond with the Company. Reinforcing customer-centricity as the core of its business philosophy, the Company has strengthened its strategically located service offices across India to cater to the domestic market. To provide service backup to the international customers, the Company has set up international offices, including wholly-owned subsidiaries and their branches/offices, based on the concentration of customers and potential for additional business opportunities. Such international offices now encompass, Europe, West Asia, South East Asia and Africa. This is to extend the reach of the Company, bring it closer to the customers and earning their trust by providing quality and timely support. As in the domestic market, the Company is committed to provide excellent and timely service to international customers irrespective of their time zones. During FY 18, the Company undertook some turnkey aftermarket projects from the international market and also refurbishments for other makes of turbines, which should provide referrals for future. The Company is continually leveraging IOT (Internet of Things) and establishing itself in the digital domain by developing and offering remote monitoring and diagnostics solution for its turbines for continuous remote monitoring of the performance of the turbines and diagnose the causes of malfunction. It will help in taking timely remedial/preventative action and reduce the expensive downtime. This tool further enhances the Company’s capability to give strong service delivery and to give live support to customers. During FY 18, the Aftermarket segment has shown a growth of 12% over the previous year in terms of order booking while the sales growth stood at 8% over the previous year. The Company is ensuring that in coming years, the aftermarket segment will provide a larger share in its overall growth. The aftermarket business has developed traction in export markets too with exports contributing over 30% of the order booking and revenue for FY 18. The Company has two manufacturing facilities in Bengaluru. The older facility is in Peenya Industrial Area within Bengaluru city and is now dedicated for turbine assembly and refurbishment activities. 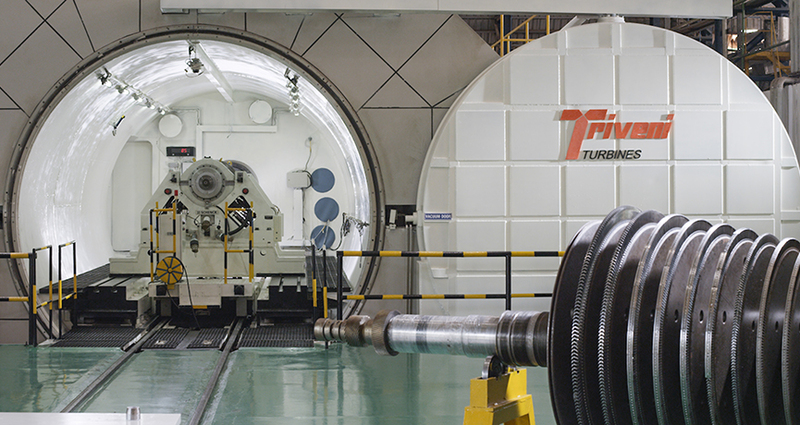 This facility also houses the Company’s state-of-the-art R&D centre, high speed balancing tunnel and fully equipped test beds for carrying out mechanical run test of turbines. The facility has capacity to produce around 150 turbines annually. The Company’s new facility in Sompura Industrial Area in the outskirts of Bengaluru is equipped with world-class machines such as CNC machines, a new state-of-the-art high speed balancing machine capable of balancing rotors up to 55 tonnes, 4 M diameter and 11 metre length and boiler with steam generating capacity of 42 ata 380 degree centigrade. With this, the Company is now able to cater to turbines up to 150 MW. The new manufacturing campus is green, ecofriendly, energy-efficient and equipped with best-in-class production facility built to modern aesthetic design. With these two facilities, the Company is now in a position to provide faster deliveries of the widest range (from 1 MW to 100 MW) of high quality industrial turbines. The Company takes pride in participating in the Indian Government’s “Make in India” campaign with designing, engineering, manufacturing and supplying cost efficient high quality steam turbines, while successfully competing with large MNCs. The products are shipped from these two facilities to global customers and comply with the best quality standards including those of API. The DSIR-approved advanced in-house R&D centre of the Company is engaged in development of new efficient and cost effective models. Furthermore, continuous product upgradation results in high-power dense, cost-competitive, robust and efficient turbines to fulfil the requirements of the evolving global market. The Company continuously monitors global trends and updates its product programmes to keep the Company aligned to latest international standards with respect to products of global manufacturers. The Company is associated with premier technology development institutions such as IISc, Bangalore & IIT, Bombay through various research programmes and therefore continues to be a preferred industrial partner for Indian Government-funded programmes of MNRE, DST and Ministry of Power. Prior to commercial use, extensive validation of the developed technology is done and the performance parameters in the field are monitored closely to evaluate satisfactory performance. The Company has well-defined processes for development, testing, field feedback and continuous advancement of technology through in-house processes and through association with global research and scientific institutions. The Company continues to develop cost competitive models, with much reduced carbon footprints so as to provide power solutions needed by its diverse international and domestic customers. The application segments include waste to energy, combined cycle, process industries, renewables, captive and co-generation apart from others. In line with the industry trends, the Company has been diversifying into different types of steam turbines and other renewable energy products focusing on high efficiency cycles. Even as such products become a reality in the near future, the Company is constantly upgrading and improving its steam turbine designs for optimal performance to meet the increasing power solution requirements globally. Several innovations take place during the process of delivering new technologies and product variants to customers. Such innovations and technological upgradations in steam turbines result in valuable intellectual property to be generated in-house. As such, building and safeguarding the Intellectual Property (IP) portfolio assume paramount importance for the Company. In order to ensure that the generated Intellectual Property is adequately captured and protected, a dedicated team of specialists work closely with the Research & Development team from the planning and conceptualisation phase to the product manufacturing phase. The Company has carried out an extensive IP strategy for creation and protection of long-term IP assets to secure and preserve the technological advantage. Reflecting its global focus, the Company constantly undertakes patent and industrial design filings in different international jurisdictions, even though the IP portfolio is developed in India. The Company has, in recent times, filed patent applications and design registrations in India, Europe, South East Asia, and in the U.S. In the future, filing of patent applications and design registrations is planned in new international markets which are served by the Company. A substantial number of Intellectual Property Rights have already been awarded to the Company in various jurisdictions. 223 IPRs filed granted and in market globally till March 2018. Participating wholeheartedly in the Government of India’s Digital Initiative and to align with the customers’ technological and commercial needs, the Company has embarked on Digital transformation in a planned manner. The Company has upgraded its ERP to latest version thereby bringing technology closer to business. All the functionalities are customised and integrated to lay strong and complimentary processes to manufacture and deliver quality product on time to our customers. Besides, the Company has recently gone live with updated Product Lifecycle Management software which enables Design and Engineering to function in an efficient, fast, transparent, secured platform and also provides a systematised control during the product lifecycle. Remote Monitoring & Diagnostic platform envisages capturing, analysing and diagnosing turbine related data from our installed base. This initiative has significantly increased satisfaction level of customers and has also helped to improve our own technological capabilities. The Company has also implemented Customer Relation Management (CRM) which is core to complex marketing needs and customer satisfaction. The Company is leveraging the ever changing IOT platform to meet its business needs. There is a tight alignment of business with technology. The Company continues to operate an effective and robust supply chain management system starting from procurement process to delivery system for sustaining competitive advantage. Successful Supply Chain policy includes inventory reduction, improved delivery service and shorter product development cycle. The emphasis is on Customer Satisfaction, cost control, including reducing rework time and rejections, quality, timely delivery, working capital management, consistency and transparency. The Company believes in the development and nurturing of “think outside of the box” and use different mutually rewarding combinations to establish a long-term partnership in its supply value chain system, which ensures achievement of its objectives. Supplier’s Code of Conduct, Annual/monthly plan, new product design, international best practices and improvement in value engineering are shared with the supply chain partners to enable them to align their businesses with the Company’s vision and requirements. With a growing focus on exports, the supply chain partners’ capabilities to meet international standards of production and supplies and competitive price have been enhanced in a planned and structured manner to meet competition and customers’ expectations. This has been possible through regular interaction with suppliers/vendors/ contractors, backed by regular exchange of information, training, planned reduction of cost, reduction of rejections, building up of sustainable trust and confidence and various other business development parameters generally followed in good business practices. There is a strong realisation and acceptance of ‘Zero Defect’ and ‘Do it right the first time, every time’ concepts by the supply chain partners and, to ensure strict adherence to these concepts, supplier upgradation programmes are regularly conducted and suppliers are evaluated using structured parameters and tools. The existing supplier partners are periodically re-assessed through a third party agency in order to ensure that the prescribed quality standards are maintained and technology is upgraded in line with the evolving requirements. For new suppliers, a well-defined qualification process is in place along with EHS requirements. All the supplier partners are governed by a strict code of conduct and non-disclosure agreements. The Company has successfully controlled the input costs by means of value engineering in design and materials, development of costeffective supplier partners and sourcing of raw materials and components from some of the most cost-effective suppliers in India and around the globe. The Company’s supply chain always strives to be a value creator through implementation of strategic initiatives year on year. In similar manner, TTL has an effective logistic system for safe and timely deliveries of its products, in India and in the International markets at a competitive cost. The Company is AS9100D / ISO 9001:2015 certified, with a sound quality management system integrated throughout the organisation. The Company has implemented a process-based management structure, where the processes are continuously evolved and owned by process owners and focussed on customer. The Company ensures that its network of suppliers and dedicated sub-contractors also comply with these standards through supplier qualification, QAPs, check lists and Standard Operating Procedures (SOPs) to maintain comprehensive quality control of turbine and its auxiliary systems. Products are designed, manufactured and commissioned in accordance with the International quality norms, such as API/Shell, ASME, AGMA, NEMA and IEC, among others. Systems are developed to address country-specific product requirements. These systems have helped the Company to meet the stringent requirements of export customers, such as CE/PED and GOST certification. The Company has adopted the ‘Zero Defect’ concept with respect to quality, which is supported by tools and techniques like visual management system, root cause analysis, followed by CAPA, DWM, DMAIC, Kaizen, SQIP (Supplier Quality Improvement Programme), SQDCM, Quality Circles, and a rigorous automated Customer Complaint Resolution System on continuous basis. “Kaizen” movement was started in the Company in 2010 to inculcate a culture of continuous innovation and improvements throughout the organisation, involving people at all levels. The movement continues to provide significant benefits in productivity, quality, cost and EHS. The Company regularly participates in All India Kaizen events organised by CII-TPM Club of India, and has bagged several awards. Products are designed, manufactured and commissioned in accordance with the International quality norms, such as API/Shell, ASME, AGMA, NEMA and IEC, among others. Systems are developed to address country-specific product requirements. In order to sustain in this dynamic business environment, and remain competitive in the global market, the Company is continuously building the capabilities of its personnel. Our People Strategy is influenced by the dynamic industry landscape and is geared to deliver transformation and growth in the current and emerging business context. We believe in building a culture that nurtures talent, drives strong performance & enables customer-centricity. The Company emphasise on Career Growth with the focus to build talent from within and also build a scalable talent supply chain model with our Young Engineers Program (YEP). In the face of rapidly changing client expectations, the Company is investing in programmes that equip people with futuristic skills and competencies. We continue to focus on building a robust talent pipeline year-on-year by inducting fresh Graduate and Post Graduate Engineers through a structured selection and training programmes. The Company has commissioned a modern new plant (Phase 1) at Sompura, near Bengaluru. The Company has strictly adhered to applicable EHS norms throughout the duration of construction, erection and commissioning of the civil work thereby achieving 1.7 million safe man-hours. The performance management system is designed to achieve employee development through performance differentiation, transparency, and effective evaluation with a structured process of formally and objectively evaluating performance against defined goals & objectives. We continue to drive a high-performance culture. The Company believes in influencing all aspects of an employee’s life – including physical, mental and emotional well-being. We continue to enhance safety & security at the workplace by prescribing policies & procedures, creating awareness and imparting trainings. We have institutionalised key policies like Prevention of Sexual Harassment policy. The Learning Centre continues to be the nodal point for employees and customers, undertaking training on a continuous basis, about the Company’s product and operation and maintenance of steam turbines. In FY 18, Officers from Manufacturing underwent certification training on Special Process in Non-Destructive Testing and Welding Techniques for further Product Quality Improvement. The Company continued with the advanced training programme for its Customer Care Engineers on ‘Service Excellence’, with emphasis on building Technical, Functional, Behavioural and Customer Relationship Management skills. The “Supplier Quality Improvement Programme (SQIP)”, as part of “Continuous Improvement” training programme for suppliers also continued in FY 18. Computer Based Product Training Lab (CBT), a unique platform developed by the Learning Centre is a comprehensive self-learning aide on turbine product and its auxiliaries. This platform is upgraded on a continuous basis to cover the technological upgradations. This also includes innovative processes being introduced/adopted. The Company dedicated a total of 5,141 plus Training Man-days during FY 18. It launched multiple programmes to upskill/reskill employees in technical as well as behavioural competences. Employees build their capabilities through classroom trainings, e-learning modules, expert and peer learning outbound trainings, on-job learnings & mentoring. This objective was achieved through training, coaching and providing greater accountability to supervisors, along with broader employee engagement through peer-to-peer feedback and by changing “at-risk behaviour” to “safe behaviour” and by fostering a more collaborative working environment and providing necessary safety equipment. EHS practice in Peenya facility continues during the year in the same spirit. The Company’s safety practices have contributed to zero reportable accidents during the previous six years. Certification renewal audit of both the manufacturing plants have been carried out in line with OHSAS 18001:2007 standards. Both the units have been recommended for continuation of certification with Zero Non Conformances for Occupational Health and Safety Management systems valid through March 2020. The Company’s Environmental Management System (EMS) is a comprehensive approach to environmental management and continual improvement that measures the performance against regulatory and management standards. Certification renewal audit of both the manufacturing have been carried out in line with ISO 14001:2015 standards. Both the units have been recommended for continuation of certification with Zero Non Conformances for the upgraded Environmental Management System standards. The certification is valid through March 2020. Ambient air monitoring study for particulates and gases, ambient noise monitoring study and drinking water analysis are being conducted on a regular basis as per norms specified by the Karnataka State Pollution Control Board and the results have been within regulatory limits. At the global level, according to a report by the UN, growth is expected to remain steady at 3.0% in 2018 and 2019. The recent acceleration in world gross product growth stems predominantly from firmer growth in several developed economies, although East and South Asia remain the world’s most dynamic regions. Cyclical improvements in Argentina, Brazil, Nigeria and the Russian Federation, economies emerging from recession, also explain roughly a third of the rise in the rate of global growth between 2016 and 2017..
After witnessing a slowdown across major international markets in FY 17, the Company has been able to secure orders from Europe, South Africa, LATAM and South East Asia and together with the domestic market, it has had a record order booking in FY 18. With the expected increase in activities in industries like Steel, Pulp & Paper, Cement and Sugar sector, the demand for steam turbines should remain robust in the coming years. With a robust enquiry pipeline, increasing global presence and strategic marketing activities, the Company is expecting to carry the momentum in FY 19, both in domestic and international businesses. During the year, the foreign subsidiaries/step-subsidiaries along with their branches have firmly established their presence in their respective regions and are actively promoting the products and brand of the Company. The subsidiary in Dubai has played an important role in API sector in the Middle East besides Oil & Gas sectors in Middle East as well as in West Asia. The presence of subsidiary in the UK has made possible to secure some orders for the Company in a sluggish market in Europe. These offices, being close to customers and capable to provide specialised services, are gaining confidence of the customers and are promoting the brand strongly, which is essential and helps the Company’s strategy to achieve market penetration on sustainable basis. These offices are well equipped with trained sales and service personnel with local talents as well as from India. During the year, the Dubai subsidiary has set up a new subsidiary in South Africa. It is heartening to note that the new subsidiary in South Africa is gaining traction in the first year of operation itself with strong order intake and good enquiry base. The Company expects that the foreign subsidiaries will further augment business growth in the coming years. GE Triveni Limited, joint venture Company with Baker Hughes GE (BHGE), is engaged in the design, supply and service of advanced technology steam turbine generator sets with generating capacity in the range above 30-100 MW. GETL offers products, manufactured to international standards of quality and reliability, with best-in-class efficiencies. The flange to flange turbine is manufactured competitively at TTL’s world-class manufacturing facilities located at Bengaluru, and the complete project is executed by GETL in accordance with GE’s manufacturing, quality and supply chain procedures and processes, which include certification of suppliers, adherence to environment and health concerns and other ethical standards. After two years of successive growth in sales and profits, the financial results are not so encouraging in the year under review due to delayed offtake by certain customers and other technical reasons. GETL booked one international order during the year. The enquiry pipeline is encouraging from international market and GETL expects to perform well in order booking despite stiff competition in this segment. The Indian market continue to remain sluggish, as in the previous year, and is likely to take some more time to show any positive outlook. GETL registered a loss on account of provisioning for a turbine supplied in FY 17 and due to delay in despatches of turbines on account of customer deferment. The JV partners are having constant dialogues in order to improve the enquiry generation and order finalisation in the JV despite the market condition being tough and the Company feel that with this renewed sales efforts, the performance should improve in the coming years. On assessment of the present market scenario and roadmap of technology developments in fray, the Company strongly believes that GETL will continue to remain financially stable with good business prospects in near future.